The scene for this card came together because I have also been playing with the Critters in the Forest set testing out the new Stampin’ Up! Blendabilities markers (I recently purchased the Old Olive Assortment and the Coastal Cabana Assortment as I’ve been keen to see how they compared with Copics). I’d been busy colouring away – animals and trees – and it hit me that I really should make the images into a card. What a novel concept! lol I decided that instead of distress inking the sky (I do tend to favour this technique), or using a stamp to create a starry night, that I would use some pretty paper from the Hello Sunshine 6×6 petite paper pack from Lawn Fawn (which I couldn’t find on their website – please don’t tell me it is discontinued…). I thought the paper was a little too bright for the scene I had begun to set so I sponged over it with Faded Jeans Distress Ink. That’s better! I stamped the greeting and embossed to make it pop and then finished assembling my scene. Materials used: Stamps – Critters in the Forest, Love You S’more (Lawn Fawn); Dies – Landscape Trio (Mama Elephant); Distress Ink Pads; Copic Markers; Blendabilities (Stampin’ Up! ); Designer Paper – Hello Sunshine (Lawn Fawn); Wink of Stella and Glossy Accents. Anyway, I hope you are all happy and well and spending lots of time creating! Thanks for visiting my blog today. Hello, hello!! I’m aiming to catch up this go-round, because this gallery of amazing is calling my name! Before I forget: Darnell has NBUS Challenge #2 going, so be sure to waltz some of your ‘new product’ cards that way; everything counts! Okay, this IS a “typical Kylie” card – an incredibly adorable scene, featuring amazing colouring a a gathering of super sweet critters! 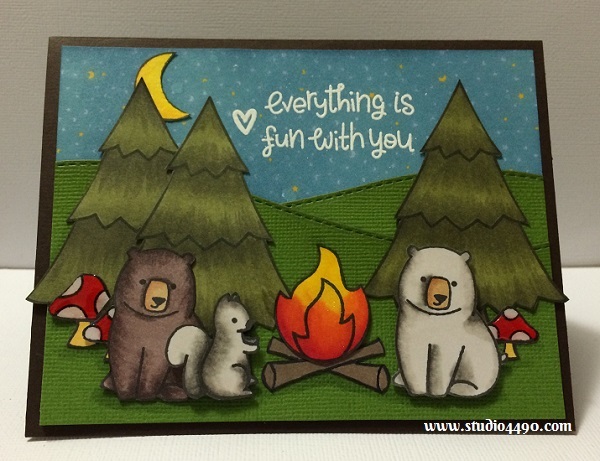 I want to join them around the fire, and given that I’m terrified of bears, this is a sign of how fabulous your card is! Darling to the max!! Off to see what’s next…and your challenge with Elle sounds like a tonne of fun! You two are quite the creative duo!! Wow…what an amazing scene you created. Just so sweet. I just love seeing your scenes, Kylie! They’re always such a lovely sight, and a treat for the eye. And this card is no exception! Love the coloring, too. That grayish white bear is beautiful, and I just love the night sky. How do you like the blendabilities markers? I’ve heard mostly negative reviews from people who use Copics, but I’d love to hear your thoughts too. I eyed them briefly in the online store, so I’m curious as to whether they’re worth investing in. LOVE this idea! I’m in! I have tonnes of the stuff too. And you’ve probably noticed that I don’t use a tonne of it. Perhaps grab a patterned paper pad and make at least three cards using it? Ooooh, challenging! Deal, Elle! One patterned paper pad and one stamp set to create three cards! 🙂 Can’t wait to see which stamps and paper you choose. I think I’ve already worked out the supplies I am going to use. Just need to make a Father’s Day card for tomorrow and then I’m onto it. Go us!! !